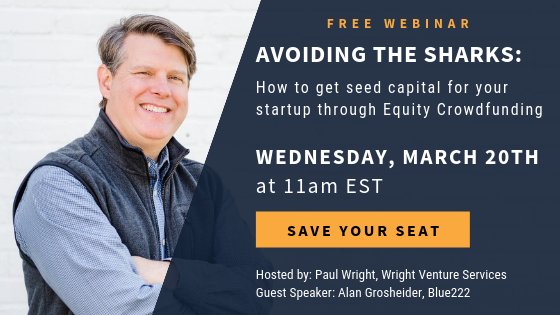 Is your startup ready for seed capital but you're not sure where to start? Do you want to avoid the venture sharks? Click below now to claim your seat! Paul is a consultant, trainer and coach to pioneering leaders and mission organizations. Wright offers a 20-year career in community economic development financing where he deployed over $20 million of both private and public funds into high impact/risks projects. He is co-owner of Wright Venture Services, a consulting company serving entrepreneurs, foundations and community economic development organizations with their marketing, strategy and programs. His specialty is in building entrepreneurial ecosystems and mentoring the next generation of entrepreneurs. Alan has been a Louisville-area entrepreneur since starting his first business in 1993. He has built several companies from the ground up, raising capital in just about any way you can imagine, including loans, credit cards, friends and family, private placements, crowdfunding, and venture capital. His largest venture to date raised significant VC funds, became a nationwide environmental inspection company with operations in all fifty states, and eventually sold to a larger firm. Currently, Mr. Grosheider is building a company called Blue222, which is "Uberizing" the business of real estate inspections on a global scale. He also runs a non-profit organization called Metro Startup Launcher, which is working to make it much easier for startups in the Louisville area to raise capital with equity crowdfunding and access several very large equity funds. IF YOU CAN’T MAKE IT LIVE: register anyway. I’ll send you a link to the replay, available for 7 days after the event. Click below to claim your seat!